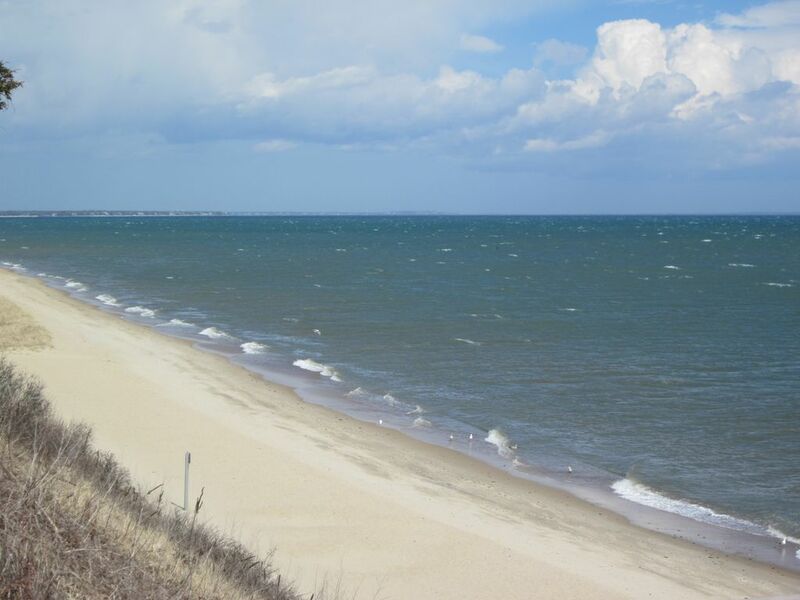 Steps to private ocean beach, Beautiful Nantucket style condo, sleeps 4 comfortably with pull out queen sofa bed, fully applicanced kitchen, private patio for morning coffee or afternoon relaxing. Restaurants, shopping, library, movies, golf and much more within a 10 minute drive. the entrance of the village to restrict beach access to non-residents. There is a no pet policy for renters or guests that is strictly enforced.The home is smoke free...non smokers only. Owner was easy to work with. Unit was clean and very quiet, much like a gated community. Was only a 2-3 minute walk to the beach. We were only in Cape Cod for the weekend with two small kids and we wanted to find a place where we could walk to the beach. This was the perfect spot. The private beach is so close and beautiful! The cottage itself is cute and clean and was perfect for our needs. Lovely property, a little tired probably because it's the end of the season. The property is just as pictured. It's very functional and pretty. Some dust on the window blinds and a musty smell on the bed prevented me from giving it 5 stars. Otherwise we had everything we needed here. The owner thoughtfully let us in early for our convenience. Beautifully decorated; adorable a BR condo! Located near the entrance of Maushop, so a little bit of a walk with beach umbrella, chairs, etc,, otherwise, perfect. Our family had a wonderful time on our week vacation at the cottage by the beach. So easy to walk to the beach with the kids and the marketplace had many activities for the kids too! Super quaint and so close to the beach! We were venturing out for our first family vacation with our 6m old and wanted something close to the beach. The location was perfect quick steps to the beach and a short walk to some shops/food. Washer/Dryer was so convenient, appreciated the other reviews stating we needed to pack toilet paper but everything else was there! The Popponesset Marketplace which offers mini golf, shopping, dining-including the Raw Bar (with Cape Cod's #1 Lobster Roll) is in walking distance, along with the Popponesset Inn and The Lure. Jogging and bike path nearby. No Pets allowed by the Association. Bookings canceled at least 60 days before the start of the stay will receive a 75% refund. •	Bookings canceled at least 45 days before the start of the stay will receive a 50% refund. d.